Standing colourful and majestic against the backdrop of its imposing and stately 4 level Ancillary Facilities Block, the neo classical Sri Ruthra Kaliamman Temple of today totally belies the stature of its original structure and magnitude when it was at its former location in the Alexandra Brickworks precincts at 20, Pasir Panjang Road (4 1/2 m.s), Singapore. What one beholds today at Depot Road, Telok Blangah New Town, Singapore is the spectacular metamorphosis of a small, rustic, and little known temple to a well-known modern Temple Complex representing probably the first Hindu institution of its kind to be built in our Republic through public participation. The old demolished Temple at Alexandra Brickworks, where PSA's Multi-Storey Warehousing Complex now is, was a brick building with a tiled roof. Within this fenced area was also a crude makeshift wooden structure which served as the priest's quarters. About 100 feet away southeast from the Temple, was the Muneeswaran Shrine. The origins of Sri Ruthra Kaliamman Temple go back to the year 1913 when it was setup as a small shrine, housed in a wooden building. One Mr Lakshmana Nadar, an employee of the Brickworks, is said to have been largely instrumental in founding this shrine. In 1923, through the assistance of the Borneo Company, whose subsidiary was the Alexandra Brickworks, the wooden structure was replaced by a brick building to give it the form of a simple temple. This temple served as regular place of worship for the majority of the Brickworks' employees- who were Hindus- as well as the large number of other Hindus who lived in the surrounding areas. 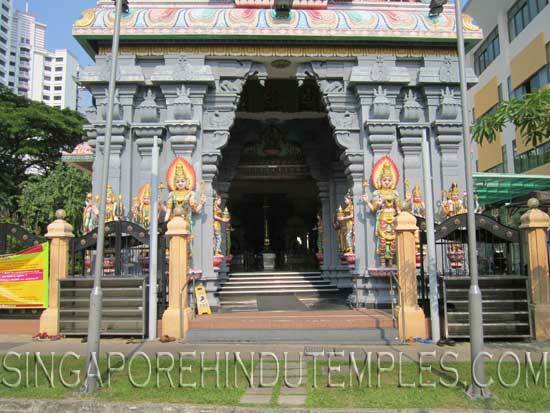 No other temple existed in the Pasir Panjang, Alexandra, Telok Blangah districts in those days- the nearest being the Sri Mariamman Temple at South Bridge Road, about four miles away. Mr Letchumanan Nadar initially looked after the affairs of the Temple. He was succeeded in turn by Messrs Solai Padaiyachi, Pumpaya Nadar, Shanmuga thevar and P Ramasamy. A Management Committee was formed in 1958 under the chairmanship of Mr Rengiah to be followed by succeeding Management Committees in 1960, 1963, 1967 and 1969 with Messrs Neelamegam Pillai, P Ramasamy, S Karralasingam and V Sivapragasam, respectively as Chairmen. The temple was maintained through donations collected from among its devotees -both the Hindu employees of the Brickworks and those from the surrounding areas. The Borneo Company and later the Alexandra Brickworks had for many years made an official contribution of S$10.00 per month until the early part of 1967. The Pasir Panjang Power Station's Hindu employees gave good support in later years when the Brickworks' Hindu employees numbers had diminished. However, there were periods in the not too distant years preceding June, 1967 when the temple lacked funds even for its running expenses. Through approaches made by Priest M Doraisamy, a new Management Committee was set up on 27 May 1967 with Mr S Karalasingam as Chairman. The new Committee devised ways and means for the systematic collection of funds to meet the Temple's pooja expenses , priest's remuneration and other expenditure. It also renovated the Temple building including some structural alterations to provide better convenience to devotees. Then followed the Asthabandana Maha Kumbabishegam (Consecration Ceremony) on 11 th February, 1968 for the installation of new granite statue of Sri Ruthra Kaliamman to replace the non granite (suthai) statue of the Deity. On 23rd October 1969, the Prathishtai (Supplementary Consecration Ceremony) was conducted to install the granite statues of Sri Vinayagar and Sri Subramaniar to replace framed pictures of these Deities. The late Mr K Raman Nair an employee of Pasir Panjang Power Station and a staunch supporter of the Temple- ordered the three statues from India and donated them to the Temple. About two years later, on 2nd December 1971, Alexandra Brickworks' Management served notice on the Temple to quit by 30th June 1972 as it had decided to sell its property to the Port of Singapore Authority. After protracted negotiations, the Brickworks Management and the Temple's Management Committee agreed upon the sum of S$260,000/- as outright compensation to vacate the Temple premises. With the assistance of the late Mr S L Perumal (the Temple Adviser) the four Deities, Sri Ruthra Kaliamman, Sri Vinayagar, Sri Subramaniar and Sri Muneeswaran were moved during the Balasthabana Prathisthai(Temporary installation Ceremony) on 5th February 1973 to the Sri Manmatha Karunya Eeswarar temple at 249, Cantonment Road, Singapore 0208- where they were to remain until a new temple was built to reinstall them. The consecration of the temple on 11th September 1983 marked the climax of 10 years of the effort by one and all in the successful shaping of the Temple. Secondly, on 27th November 1987, the Sakthi Sametha Navagrahas Kumbhabishegam was held, the first of its kind in Singapore. Such statues are also very rarely found - even in India. Another significant ceremony was the inaugural Flag Raising Ceremony, which was held on 22nd April 1988. The Temple complex has a distinct and separate 4 storey annex block which makes it complete to hold activities such as weddings, social, educational and cultural activities. With fund limitation, the idea of a neo-classical temple at 10 times the initial financial resources available was thought to be building castles in the air but it slowly but surely materialized. Apparently the success story of the birth of the new updated temple costing about $2.7 million.